Below you will find many Ideas for Linoleum Arts & Crafts Projects & Activities with Linoleum to Create Block Printing Arts for Children, Teens, and Preschoolers. To make good linoleum block prints use a smooth grade of unlacquered linoleum which is light enough in color to make transfer lines, drawn in pencil, easily seen. Buy an extra piece on which to practice cutting deep straight lines at a slight angle. Because straight lines and large surfaces are most effective in linoleum prints, select a subject that will not require much detail. Draw the design on paper the exact size of the block and place it in reverse on the block. To do this, rub oil over paper sketch to make it transparent. Rub the face with white chalk. Place face down on block. Trace with a pencil. Retrace the chalk lines with ink. In printing, the right hand side of block will become the left hand side of the completed print. You must make sure that your parents, teachers, or suprevisors are okay with you using these linoleum cutting tools. Although all block cutting may be done with a well sharpened knife, the most serviceable tool is the medium V-shaped veiner, Fig. 1, which may be purchased for a small sum of money. 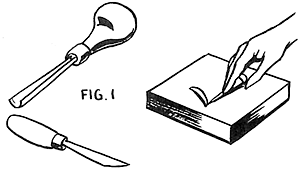 Always cut away from the person and keep the hand which holds the block behind the direction of the cutting tool. The portion which is not to be printed may be cut away in large pieces. Cut the finer detail lines after all lines have been outlined with the knife. Round the outer edges of the block slightly after the cutting has been completed. Although the ink can be applied with a brush the results are not always as fine as when the ink is applied with a brayer, an instrument used for spreading ink. Fig. 2. Press some printing block ink, which comes in a tube, onto a piece of glass. Smooth it out with a side of a knife. Run the brayer back and forth over the glass until it is well inked. Then roll it over the surface of the block. Lay a piece of unglazed paper on top and with a smooth board press the paper against the linoleum. Or you may use an ordinary clothes wringer for a press. If the first proofs are not up to expectations, trim off the rough edges that remain on the block. Always clean the block with a soft rag and gasoline. Wrap in newspapers and keep in a dry place until you wish to use it again. 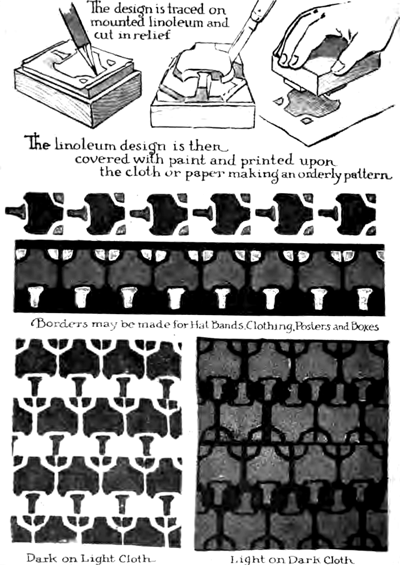 Find out how to make patterns with Linoleum Block Prints...the above diagram illustration shows you how to do this. Patterms are perfect for wrapping paper, tablecloths, cards, and drapes. You can make professional looking items with the use of a good linoleum block print. Find out how...above. 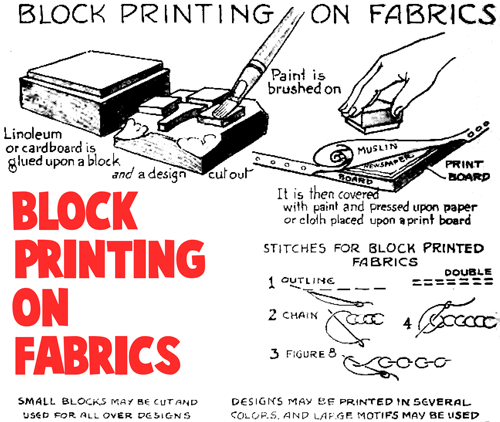 Look at the image above to find out how to cut Linoleum Blocks and then in turn use them for block printing on fabrics. There is a process to do it right. First you brush the paint on the block. You need to cover and staple the fabric on to a board to keep the fabric tight and flat. Then ou press the block onto the fabric. Block Print Cards Made with Linoleum - - Patricia Zapata demonstrates how to create your own handmade block print greeting cards with linoleum. Block-Printing T-shirts Craft with Linoleum - - Special thanks to crafter Stacy Monakey for sharing this fun and creative craft. Easy Linoleum Print How To Tutorial- - Linoleum prints are easy (but don’t seem easy), are really fun, and can be completed while watching Netflix movies. Although you need a “linoleum” block, these blocks are not actually made of kitchen-tile linoleum (as some imagine), and are not actually that expensive. Fish Prints Arts & Crafts Idea for Kids - - Use this simple fish-print technique to make a one-of-a-kind T-shirt that's perfect for adults and kids alike. Funky Ceramic Wall Vase - - Laura Jean McLaughlin sculpts a ceramic wall vase Craft Activity to Make with Linoleum. Handmade Linoleum-Printed Memory Box - - Make your own unique linoleum print, hand-painted paper souvenir box. Hand-Stamped Wooden Box Making Instructions - - Suzanne Summersgill shares her hand-stamping process for her wooden box with a little girl preparing to go swimming. How to Carve a Linoleum Block for Printing - - Making your own holiday cards is creative and fun - and it enables you to create an individual expression in a world of mass-produced products. Here's how to prepare a block for printing. How to Design Holiday Cards for Linoleum Block Printing - - Mass-produced holiday cards are available in a mind-boggling array of designs and themes, but making your own allows you to personalize your holiday message. And besides, it's fun! Here's how to design a card. How to Make a Holiday Pop-Up Card Craft for Children - - As a favor to a friend, Lynne Willis designed a wedding thank you card, which inspired her to start making greeting cards of all kinds, including this clever holiday pop-up card. Follow these instructions to make your own holiday card. How to Make Linoleum Stamps - - Linoleum stamps provide a method of art printing that can be adapted to the abilities of a skilled artist or simplified for beginning hobbyists. Blank linoleum blocks that are ready for carving are available from most art supply vendors. How To Make Linocut Christmas Cards Art Project - - For those of us whose artistic talents extend no further than painting our faces, lino cutting is the perfect craft. I’ve chosen what I hope will be a simple design - a red snowflake. How to Make Rubber Stamps to Make - - If you can not find the stamp you are looking for or don't want to spend the outrageous prices of rubber stamps, make your own. It is easy once you get the hang of cutting the stamp block. 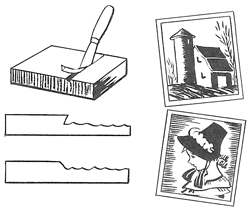 Stamp block is like a flat eraser made especially for the purpose of cutting a shape used for ink and dyes. These rubber stamps can be used forever. Introduction to Lino Cut and Block Printing - - Whether you are new at rubber stamping or an old pro, making your own block and lino cut print is a fun and creative project. See how it's done! Linoleum Block Carving Craft Activity for Kids - - The materials needed are reasonably priced and can be found at an art or craft store. A speedball linoleum cutter, a carving block of some sort (like a soft eraser or print block like soft-kut), and inking pads or printing inks (and a brayer, if using printing inks. Linoleum block printing Jig Arts Project - - If you want to do multiple-block printing, you have to have some way to line the edge of the paper up every time, so that, say, the red background printed from block 1 lines up with the black foreground printed from block 2. This is called registration. Linoleum Block Prints - - A lino print results when a piece of linoleum (either household or special lino you can purchase from an art supply store) has had pieces cut out of it, been inked and been printed. For this activity, sharp tools are required. For this reason, it is not recommended that you try this with children under the ages of eight or nine. ALWAYS have an adult present. Linoleum Printing with Kids - - My six-year-old and my four-year-old were able to do everything in this process except the cutting. This is the first time I’ve done this since high school, so I’m certainly no expert! Do you like it when I tell you that I don’t really know how to do something, but then I proceed to tell you how to do it? Yeah, I have a problem with that. Lino or Linoleum Block for Linocut Stamp Carving - - Linoleum, more commonly known by the shortened name, lino, was originally developed as a floor covering. It is now popular with artists who carve into the smooth lino surface, creating linocut blocks that are used for block printing. These carved lino pieces can be used for a variety of purposes, including creating art prints and printing images on t-shirts. Small linocut images also make great stamps. 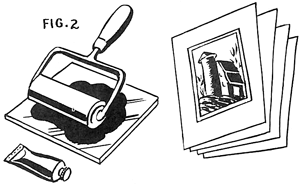 Small pieces of lino can be carved to make custom stamps. While lino is a little harder to work with than other carving blocks, it is relatively low cost and readily available. Make Linoleum Block With Letters - - When making words on a linoleum block, you have to follow a few guidelines for the stamp to come out right. See how it's done! Making Linoleum Block Prints - - Linoleum blocks can be used to print cards, make your own wrapping paper or simply for art. Printed Grocery Tote - - These fashionably printed grocery totes will have you saying "no thanks" to plastic bags. Pumpkin Raccoon - - This raccoon bandit is intent on stealing some candy. His nose was made with a pointy gourd (especially good for sniffing out treats) that was fitted into a hole in the front of his pumpkin head. Recycle Linoleum Scraps for Decorating Crafts - - Linoleum is a great do-it-yourself home makeover project to give kitchens, bathrooms or laundry rooms a quick face lift. Now you can be eco friendly and green by recycling your leftover linoleum scraps into a variety of home décor craft projects. Trash to Treasure: Old Linoleum - - Stamps used to make decorative prints are crafted from old linoleum. First, various shapes are drawn onto the back of a piece of self-adhesive linoleum. The shapes are cut out with a utility knife and then adhered onto particle board. To make the decorative print, acrylic paint is distributed over the stamp, then the stamp is pressed onto the canvas (almost any surface can be used). When complete, the stamp can also be used as a wall hanging.